Downtown Cincinnati has experienced tremendous progress over the past 10 to 15 years. The Aronoff Center for the Arts was built along Walnut Street which sparked the investment seen in the nearby area now called the Backstage District, two new professional sports venues were built along the riverfront along with the National Underground Railroad Freedom Center, the convention center was expanded, the Contemporary Arts Center was prominently rebuilt, the renovation of Fountain Square sparked millions of dollars worth of spin off investment nearby, and hundreds of new housing units have been developed. Over this same time crime rates have gone down, population has increased, commercial occupancy rates have held steady, retail spaces have filled up, and the hotels boast the highest occupancy rates in the metropolitan region. But as in any situation, one solution often creates another problem. Case in point, the Metropole Apartments on Walnut Street are now slated to become a trendy 12c Museum Hotel which will relocate the low-income residents that currently call the building home. This will not only create a difficult situation for the large number of people living there, but it will also take away a large number of full-time residents from the downtown population. The same situation is shaping up at the Phelps apartment building that fronts onto the picturesque Lytle Park. The 137 apartments there will more than likely be lost to an extended stay hotel that will take advantage of the downtown commercial success, but once again, another large block of full-time residents will be lost in the process. The interest in the downtown commercial market is very encouraging, but downtown must be able to be thriving both commercially and residentially in order for it to become that 24-hour downtown we all hope it will become. 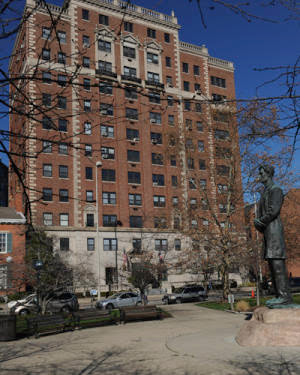 The apartment conversion of the historic Enquirer Building will help offset the aforementioned residential loses, but an apartment conversion of the historic Bartlett Building would also do wonders for the residential component of downtown. The Banks is slated to add hundreds of new residents to the urban core, but there are also great opportunities for residential density at 5th & Race, 7th & Vine, Court & Walnut, and Court & Elm/Race. A residential strategy should be employed to best maximize the use of these areas – high rises at 5th & Race and 7th & Vine, midrise at Court & Walnut, and a mixture of townhouses/rowhouses at the Court & Elm/Race area would seem to be a good strategy off-hand that would create different price points and unit options that would appeal to a wide variety of people. To become a truly vibrant downtown beyond the hours of 7am to 8pm, Cincinnati must develop a downtown residential plan that will massively grow the downtown population base and infuse the area with a mixture of young people, families, and retired individuals. If this can be achieved, then the retail and nightlife mixture we all hope for will follow. Phelps Apartmens photo by Mark Bowen of the Cincinnati Business Courier.